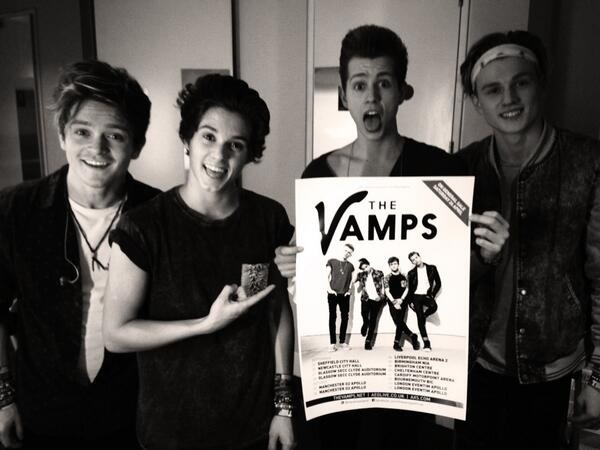 The Vamps announce UK arena tour with Union J to support! Because writing a second album, releasing a new single and conquering the world isn’t enough! The Vamps have announced their first ever UK arena tour for next year! Brad, Tristan, James and Connor will play ten dates across the country, starting at Glasgow’s SSE Hydro on April 8, and are bringing best mates Union J with them! The random world of The Vamps! The Vamps are releasing their first ever book this year! Tickets go on sale from 9am on October 18 and the boys have secured 30,000 tickets at £9.50 to make it more affordable for their younger fans – aren’t they sweet! Earlier this month The Vamps showed off their latest music video Oh Cecilia, featuring Canadian future popstar Shawn Mendes. Would You Rather With… The Vamps! The Vamps on Fun Kids! The Vamps are back with loads of new music! James from The Vamps has started vlogging!